Clematis cirrhosa 'Balearica' is winter-flowering evergreen clematis originating - as the name suggests - from the Balearic Islands in the Mediterranean. It features characteristic small, bell-shaped flowers which are creamy white in colour and have a light lemon scent. The insides of the flowers have brown, maroon or orange freckles, set off by yellow anthers. The green summer foliage turns to bronze or purple in the winter. 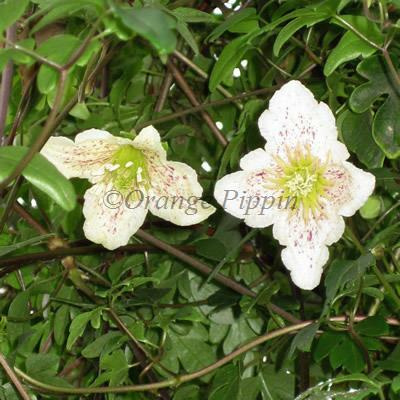 Clematis cirrhosa 'Balearica' was introduced from Minorca in 1783.